Bone Spur, Oseophytes, What Causes Bone Spurs? A Bone Spur, also called an 'osteophyte', is a small (hopefully) growth of bone tissue that can develop on any bone in the body. Spur growth on bones don't just happen magically, for no reason. They are not spontaneous bone formations. Osteophyte formation happens as part of a predictable pattern. The spurs grow for a specific set of reasons, and surgery to remove a spur will usually result in the spur growing back again at some point in the future...because the factors that caused it to grow are still in place with the surgery is complete. What is a bone spur? Medically a bony spur is called an Osteophyte, but most people just call it a cause of a pain problem. Common sense says that a spur of bone would HAVE to hurt. However, lots of people have bone spurs and they have no pain. So having surgery to remove the spur is not a guarantee of becoming pain free. An osteophyte is a bone growth on a bone. This formation can look a variety of ways, but essentially it is a growth of bone on bone. And it is only found when doctors go looking for an explanation of why a patient is having pain that hasn't gone away with Rest and Anti-inflammatory drugs like Ibuprofen. Unfortunately doctors don't have a functional explanation of why osteophytes develop. They explain it as a mysterious process of bone growth for no particular reason. So their job consists of finding a bone spur, and then removing it via surgery. The bony growth of a bone spur is made up of the same bone tissue as the bone it developed on. Osteophytes usually continue to grow slowly over time, though they don't have to. Osteophytes are involved in the pain dynamic, but aren't directly responsible for causing pain. It does look like they are obvious cause, but looks can be deceiving. While there is an entire biochemical explanation as to -how- osteophytes form, that's too deep for our purposes here, and irrelevant. Here's what you need to know: The body shapes itself to the forces placed upon it. An osteophyte formation -starts- because there is too much tension placed upon bone in that spot, thus the brain tells the bone to get stronger. This looks like bone growth, and then continued bone growth. More bone is stronger, right? Unfortunately not, and the brain is kind of dumb in this area, but let's cut it some slack, shall we? Whether it's a cervical osteophyte, or a spur on a shoulder, hip, or ankle, that bone growth occurs because there is too much force being applied to that spot. A muscle's job is to absorb force. When a muscle is too tight, or is not firing optimally, it's abillity to absorb force is reduced. But all that force has to go somewhere! And that's why osteophytes form. So, too much tension/force/pressure/pull from connective tissue and muscle is what causes bone spurs. An osteophyte doesn't just grow all by itself for no reason. The Tendonitis dynamic is a primary reason for bony spur growth. More and more muscle tightness and connective tissue constriction adds more and more tension to the structures. Not tendonitis itself, but the factors of increasing muscle tightness, connective tissue constriction, and reduced ability to absorb force. I said earlier that a bony spur didn't necessarily equal pain. LOTS of people have bony spurs and have NO symptoms. The medical establishment considers osteophytes to be a -cause- of pain and problem. So they go in to remove them with surgery. But after surgery, those spurs tend to grow back, and pain returns (if it ever actually went away). If a spur is growing and pressing into another bone, or joint, or is growing inside a joint, then that is a direct problem. But for heel spurs, shoulder spurs, cervical spurs that aren't pushing into anything, etc, then while the spur itself -may- be causing pain, chances are that it's not. Your doctor would never agree with this, of course. 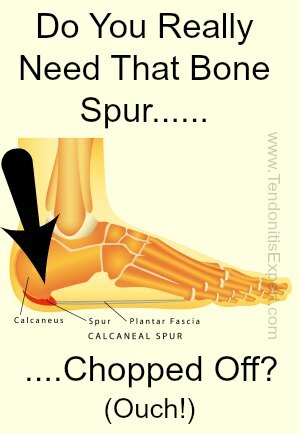 What causes the pain that bone spurs are commonly associated with? Remember also that I said there are factors that cause spur growth, and that surgery doesn't remove those causes? Those causes are also the reason that there is pain. Alleviate those factors, and bone spur pain goes away. This can be easier said than done, of course. Depending on how far along the spur is, your only effective options are surgery or the ARPwave System. But remember, bone spurs in and of themselves don't cause pain, it's the dynamic surrounding the formation. Massage can help, don't get me wrong. My self care DVD/Ebooks can help. But if there's spur growth, there are factors at play that just might require a bigger gun. And no amount of massage is going to reduce the size of the spur. Once it's there, it's bone. Rest won't work. Corticosteroid injections won't work. Anti-inflammatories like Ibuprofen won't fix any thing. Immobilization won't fix anything (it wil make things worse in the long run). Chiropractic pretty much can't/won't fix anything. Same with Accupuncture. Same with Physical Therapy (stretching, strengthening, ultrasound, e-stim, etc). Sure they're worth a shot I guess, but I've yet to hear of or meet anyone that said "Yeah, that fixed my bone spur/pain." The most effective bone spur treatment is The ARPwave System. The ARPwave sets TOO TIGHT muscles and connective tissue back to length and relaxation. This quickly removes the constant, chronic tension and torque from the affected structures. And when muscles and connective tissue are set back to appropriate tone/length/etc, the entire mechanism changes and the pain signal is no longer sent. Any treatment for bone spurs that doesn't drastically reduce muscle tightness and connective tissue constriction is doomed to fail. Surgery removes the spur (causing pain and damage and triggering an increase in tightness) and may temporarily open tissue up depending on how much cutting they do in there. Aside from the trauma of surgery, than can help for a while. It can even help for a long while. It just all depends on your exact situation. For the majority of people, assuming that the surgery is a success, bony spurs take so long to grow back that it's not much of an issue. A small bit significant percentage of people end up worse off after the surgery. And if you're a runner, or an athlete, or your job has you be on your feet a lot...you want to deal with it right the first time, just to save yourself all the wasted time and effort and pain, disappointment, and worry. Oseophytes, like anything else, can be a minor or major problem. And just like every other pain issue, they exist and develop due to a predictable set of factors. If you want to be pain free, you need to reverse the mechanism that causes the pain in the first place. Return to the top of this Bone Spur page.